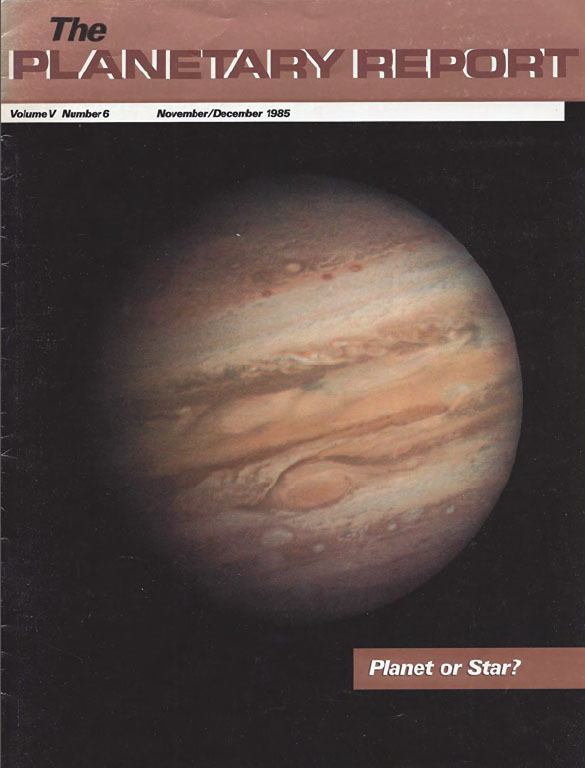 On the Cover: Almost a star, giant Jupiter is the lord of the planets. It radiates four times as much energy as it receives from the distant Sun—energy from the slow contraction of its huge mass, 318 times that of Earth. But even Jupiter is not large enough to sustain a thermonuclear fire, so it represents a class of bodies intermediate between tiny, rocky planets and the huge, gaseous objects that collapse into stars. 4 Van Biesbroeck 8B: Brown Dwarf and Extraordinary Planet: Donald W. McCarthy, Jr. explains how the discovery of this unique world can help us learn about extrasolar planets. 7 What is a Planet? Jonathan Eberhart looks at the history of this important question in the light of the discovery of Van Biesbroeck 8B. 8 Approaching Uranus: Voyager 2 Prepares to Encounter the Seventh Planet: Reta Beebe and Jay Bergstralh highlight what we can expect on the next stop in Voyager's Grand Tour. 3 Halley's Comet A poem by Diane Ackerman. 12 News & Reviews Planetary climates; Halley hype. 13 World Watch National Commission on Space, and U.S.-Soviet cooperation. 14 Society Notes Voyager encounters Uranus; scholarship winners announced.